We remove the stress and confusion from the application process and help our students gain admission to the most selective and competitive colleges. We are seasoned graduates from top-tier undergraduate and graduate schools, former admissions officers and interviewers, and directors of national scholarship foundations. But above all, we are creative admissions strategists and student mentors. Our team has worked in admissions offices and at some of the most respected firms in finance, management consulting, and private equity and has attended some of the most competitive graduate programs. We have experienced firsthand how a top-tier college accelerates the start of a promising career, and we work diligently with our clients to help them gain access to the same opportunities we have had. Serving applicants across the globe, we do not reiterate common knowledge available from published admissions books and guides. We are creative admissions strategists, and we provide strategic insights, tactical know-how, and actionable advice to help our students gain admission to the most competitive colleges and universities. 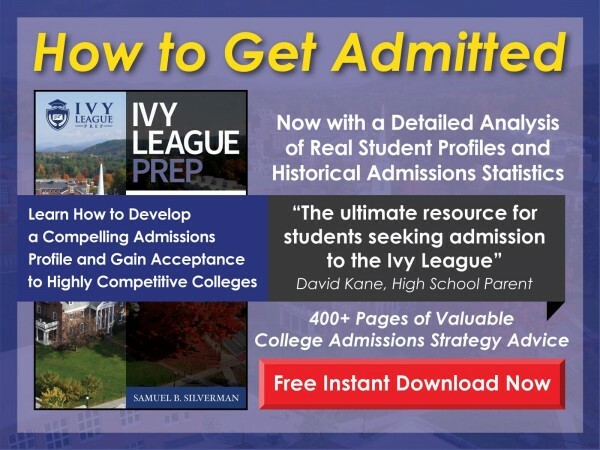 At Ivy League Prep, students and their families get the intimate one-on-one service of a boutique, plus the depth and breadth of an established admissions firm. We help serious applicants optimize their personal, academic, and extracurricular profiles to ensure a more competitive and compelling candidacy. All students work directly with a Managing Director with the support of a team of senior admissions counselors, so that every student has the continuity and accountability of a dedicated and experienced Managing Director AND the school-specific knowledge of an entire admissions team.